Together we can put an end to bullying...for good! Start an Upstander Alliance at your school and create a team of youth and adults working together to help prevent bullying and raise awareness. Join now to get a free student tool kit and moderator guide you can use to build and motivate your team! Create a team project that will engage your entire community and change them into positive Upstanders against harmful harassment, teasing and bullying. BullyBust launched the Upstander Alliance to empower youth in the effort to prevent harmful harassment, teasing, bullying, and cyberbullying across our schools today. We know that students can positively change the way we communicate with the right tools and supports. 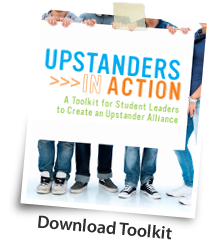 The Upstander Alliance provides free resources to help student teams, in collaboration with adult moderators at the school, create targeted community-wide engagement projects focused on preventing bullying and raising awareness. Through the Alliance, team members will have access to detailed tools for creating and sustaining their group, opportunities to connect with artists, experts, and youth leaders who are making a difference, and will also be able to share their experiences with other Alliances across the country.